Anil Kapoor, who plays Kartar Singh in Anees Bazmee's latest romantic-comedy film 'Mubarakan', was in his usual ultra-energetic and ultra-casual self, almost friendly with the humble photographers, who turned him on to say his famous 'jhakaas' dialogue, asked the question to the media present, "When was the last time a typical family entertainer made it big on the Bollywood Silver Screen?" The answers led to Mubarakan's director Anees Bazmee's filmography, which consists of films like 'No Entry', 'Welcome', 'Singh Is King', 'Thank You', 'Ready', 'Welcome Back' and they need no further information as they are all part of a series of prolific family entertainers and there are still many left yet to mention. Anees Bazmee is back with 'Mubarakan', which has the most recurring element of his films--presence of stars. Anil Kapoor answered, when he was asked about the 'huge successes that these family comedy films have enjoyed with the masses but the critics have repeatedly raised questions at their logic and intentions', that after spending 38 years at the industry, he must have done 'something right' to be standing where he is today, having himself made a name for himself through the same. He recalls a word of advice by Raj Kapoor, who used to say that 'entertain the people, and give a small message at the end.' Oh! What a simple way to end the discussion, but he has a point, that doing family entertainers have made the major contribution to their stardom-longevity. Indeed, if not for these films, how is anyone going to ever receive such ubiquitous, pan-India fame? How is one going to become a household name if he is only relatable to a certain, exclusive audience? If his dialogues lend voice not to the common man but to the privileged and educated minority of the aristocrats? Well, their films might not please the critics, but they certainly please the actors as they are ascended to a 'larger than life' celebrity status. 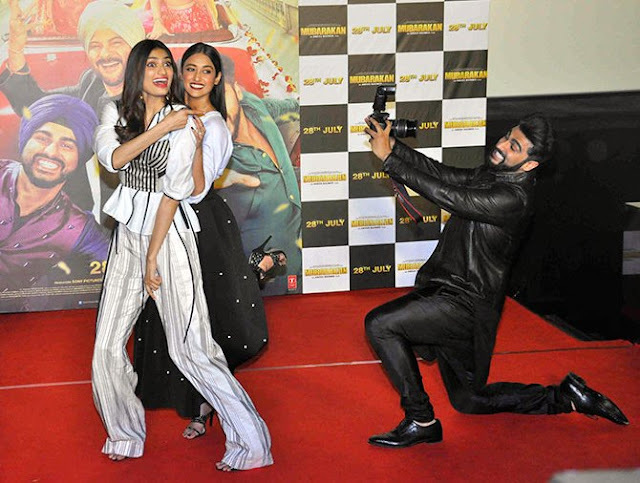 Arjun Kapoor, who is usually chilled out, was 'nervous' about performing a double role. He told us that they used 'tennis ball as markers' who plays both the twins, Charan and Karan, as they are together for most of the film. The VFX was done by YRF team who also did the same for 'Dhoom 3'. Arjun also recalled the unique identity of both female actors on set, and the banter he had with Ileana. He was full of praise for Ileana and told us that it was very easy to work with her as you don't have to 'spend time to break the ice' with the co-actor as she was familiar with the comedy genre, and working with her was a 'blessing in disguise'. About Athiya Shetty's character, who brought the simplicity which she 'inherently has' in her. Overall, he was very happy with the casting. His favorite double role is from the movie Kishan-Kanhaiya, which was to him 'very underrated'. Anees Bazmee answered the question whether it took an extra effort on the editing table to shoot such a script, he had a simple answer. Like an old adage, he said that a film is made 'in the script', and if you are able to 'execute your script' according to the plans, than there is 'no confusion on the editing table', yes, an answer along the lines of his films' philosophy. Anil Kapoor stressed on the films of Anees Bazmee which don't have any 'double-meaning' dialogues, as he entertains the audience with 'innocence'. The elegant beauty Ileana D'Cruz had so much fun on the sets that she wants to relive 'crazy journey', asking for 'when's the part two?' She said that there were no 'cat fights' between her and Athiya, and they have 'contrasting characters' in Mubarakan, her being a 'proper Punjabi Kudi' and typically so, impulsive.